I don’t know many people who don’t like snacks. Talking about snacks, making snacks, eating snacks, thinking about snacks… you can’t even say the word ‘snack’ without a little smile. 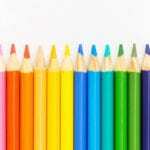 But let’s face it – just like with meals, it’s easy to fall into ruts and lose inspiration. 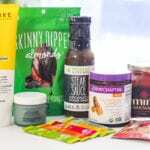 Recently a reader sent me an email, asking if I could share a few of my favourite snack ideas. 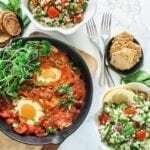 She asked that they be filling, high in protein, and ideally include a few interesting options because she’s tired of the same flavour and textures every day. Since I love solving food boredom problems, I got right on it. As a result this post was born, and I’ve tried to include an assortment of plant-based and portable options. If one of your faves is missing, don’t keep it a secret! I’d love for you to add it on in the comments at the bottom. ? Probably one of the simplest options out there, but one of the easiest to prepare and carry around wherever you’re going. Does anyone else out there boil a bunch of eggs at the beginning of the week for snacks all through the week? 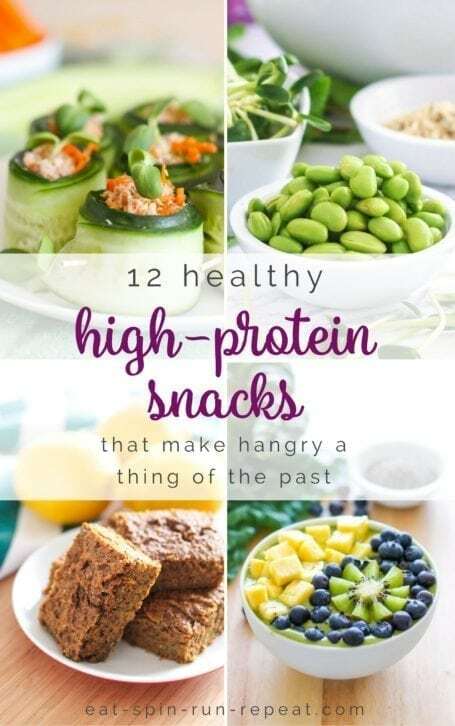 I definitely do, and when you’re hangry or needing a source of protein to quickly throw into a salad, these are my go-to. 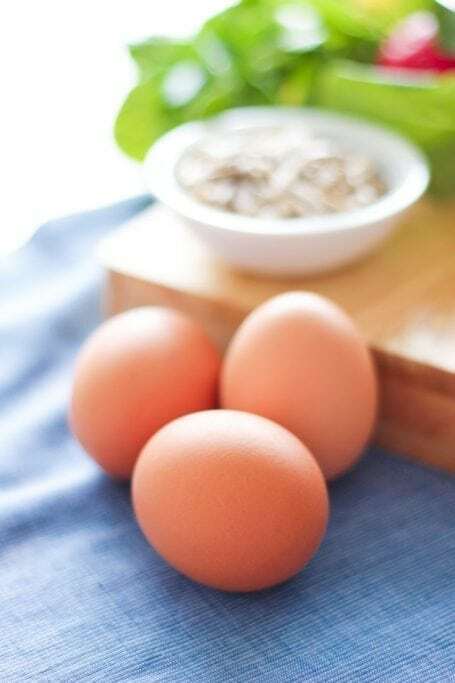 With 6g protein per egg, all four fat soluble-vitamins (A, D, E and K), B-vitamins and valuable nutrients like selenium and copper, it’s no wonder they’re referred to as a perfect protein. For optimal nutrition, look for eggs from chickens that are raised on organic diets and cage-free environments. The deeper the colour of the yolks, the more nutrient-rich the diet of the chicken. The beauty of smoothies is that you can blend in whatever ingredients you need to help you achieve the goal you’re trying to solve. 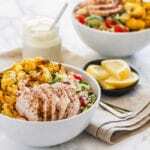 For example, if you’ve just been doing an intense workout and recovery is your priority, ideally you’d blend in a source of protein to help with muscle repair, a source of carbohydrates to replenish your glycogen stores, and some foods with anti-inflammatory and anti-oxidant properties to help speed recovery. 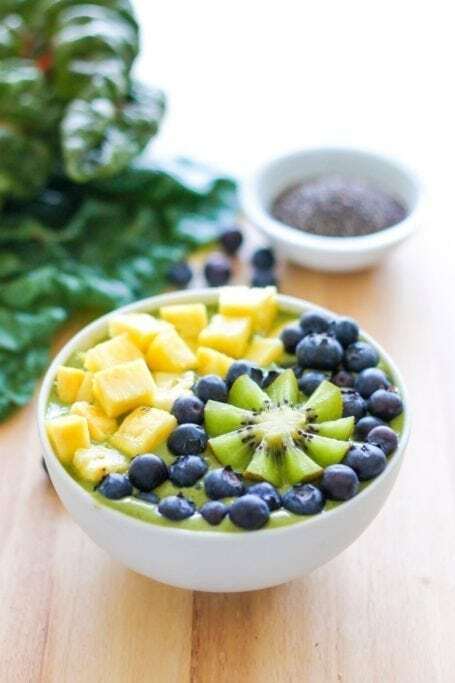 Note that post-workout isn’t the only time green smoothies are great. 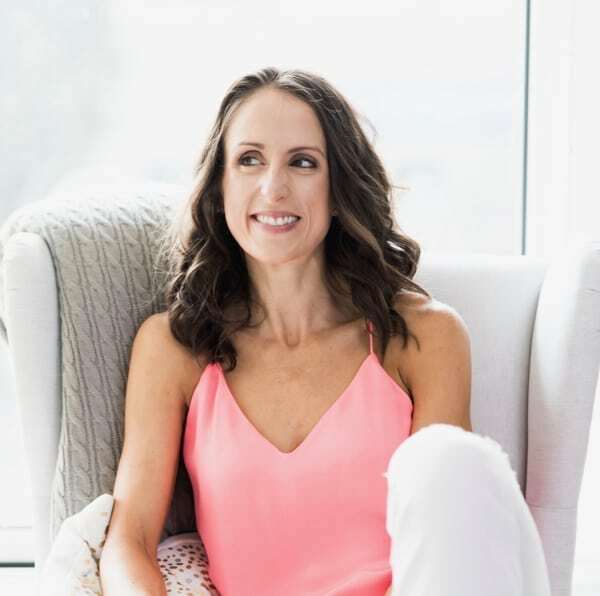 I like to think of them like medicinal concoctions or elixirs where every ingredient has a role, whether that’s contributing to post-workout recovery, stress relief, or beauty boosting. Oh, and if whatever you’ve blended up needs a little help, check out these tips on how to fix a smoothie gone wrong. Quite possibly one of the easiest snacks to pack no matter where you’re going, this is a favourite of mine for hiking and plane trips. (No liquids = no trouble in security!) 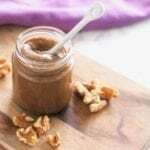 You’ll get both protein and fat from the nut butter which will not only help to keep you full, but also prevent increases in blood sugar from the fruit. 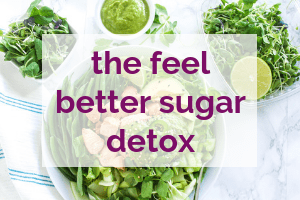 Want to really keep a lid on your blood sugar levels? Sprinkle some cinnamon on top too. 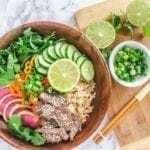 Sugar and portion control are definitely factors you’ll want to keep an eye on here, and I feel like everyone I know seems to have trouble closing a bag of trail mix! I often make my own mixes with a larger amount of raw nuts and seeds than dried fruit, and a small 25g handful of raw almonds alone will provide 5g protein. 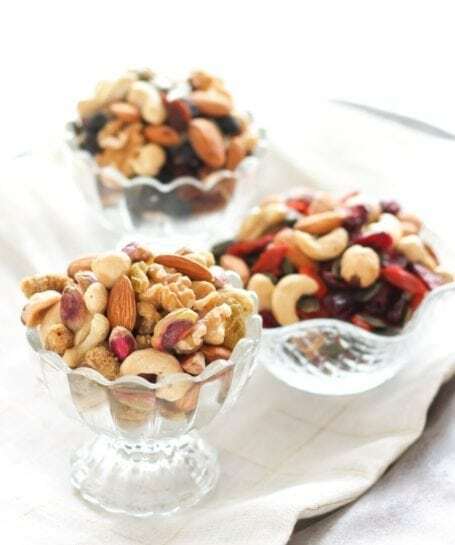 Just like nuts on their own, it’s ideal to keep trail mix in the fridge so that the valuable fats don’t go rancid. (You definitely want to keep your trail mix away from areas where they could be heated, like a cupboard over the stove.) And don’t forget to add in a few fun bits like dark chocolate, because anti-oxidants are important too! 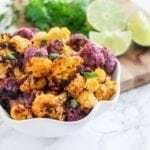 This is a great make-ahead option that satisfies cravings for a good crunch, and the beauty of them is that you can make sweet or savoury batches. I’ve got my favourite sea salt + black pepper crispy chickpeas coming up as part of this Wednesday’s recipe, but the seasonings are endless. Curry powder, cinnamon + pumpkin pie spice, chipotle lime, salt and vinegar (get that recipe from my Instagram feed here) – you get the idea. To roast, simply cook some chickpeas, pat them dry, toss them in a little avocado oil (ideal for high roasting temperatures), then in your spices of choice. Roast at 425F for about 40 mins, shaking the pan every 10-15 minutes. 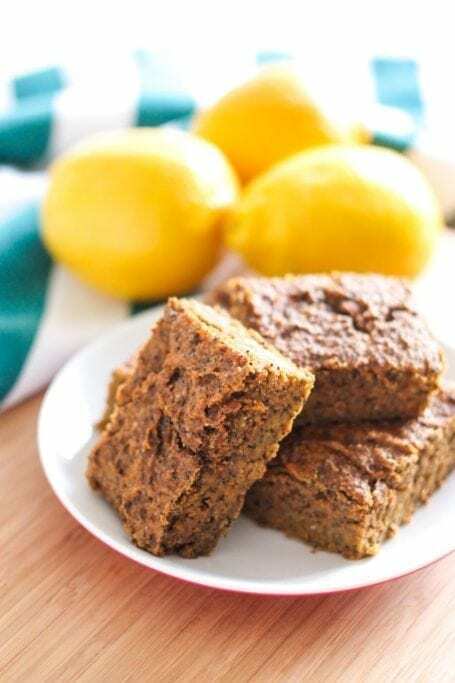 Voila – crisped to perfection! 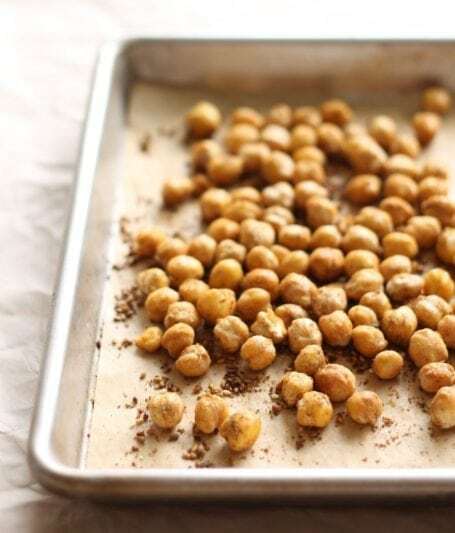 Note that if you don’t have any chickpeas on hand, you can do the same with nuts and seeds – just keep an eye on them as they won’t need as long to roast and can be cooked at a lower temperature (~300F). One of my favourite car snacks (or car picnics, as I like to call them) is a jar of homemade hummus, a bag of gluten-free Mary’s Gone Crackers and another bag of chopped raw veggies. 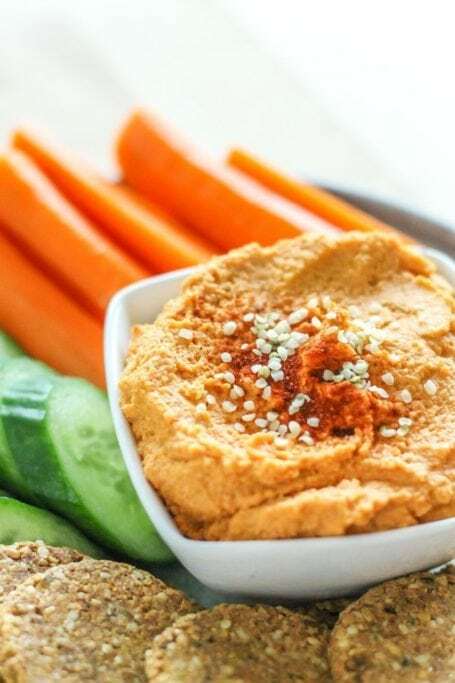 Just like the whole roasted chickpeas, you can mix in whatever spices you like in the hummus to make a high-protein dip that doubles as a spread if you have leftovers. 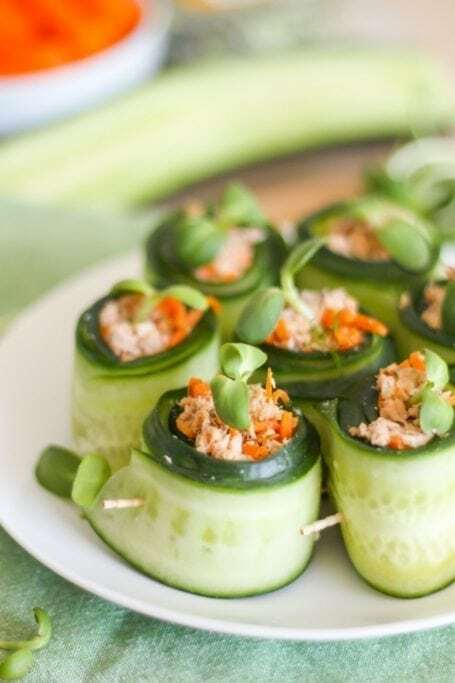 You could have it on crackers, but rolling a simple mixture of canned salmon or tuna, some minced herbs and lemon juice up in strips of cucumbers means you get a serving of veggies in the same bite. 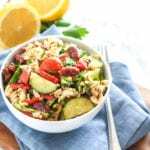 I do this with sardines too, and I know sardines gross a lot of people out, but I personally think they’re delicious – not to mention a great source of protein and omega-3 fats! You’ll find these in the freezer section of the grocery store, both in shelled and podded form. The beans are already cooked, so all you need to do is let them defrost and voila – instant snack. 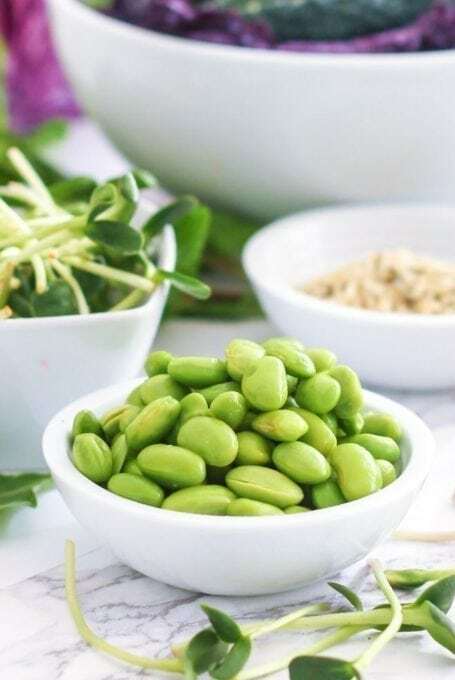 Half a cup of shelled edamame gives you 10g protein, as well as calcium and iron. Another easy way to get your veggies and protein all in a few bites, sans-cutlery. These take a little bit of prep work, but they always look impressive when they’re done, especially if your fillings are colourful. I like using cooked shrimp (4 = about 6g protein), but bits of cooked or smoked salmon are delicious too. 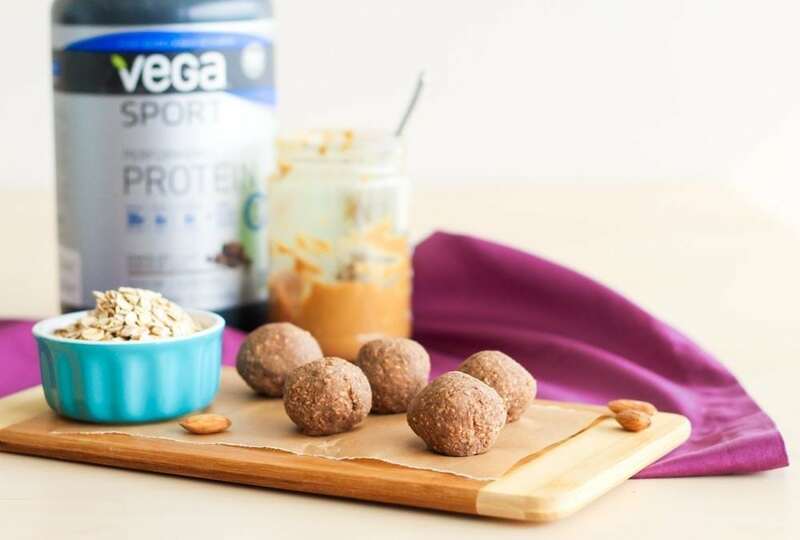 For all my vegan friends out there, you can still make these a high-protein snack without animal protein. 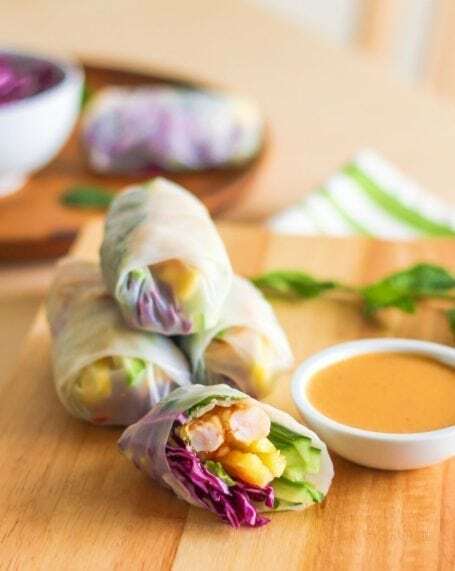 Try swapping in grilled or marinated tofu and tempeh, or roll smashed shelled edamame into your rice wraps. And don’t forget the dipping sauce. ? For those of us with a sweet tooth, these are a fantastic way to satisfy it! Made with protein powder and gluten-free oats, the mix-ins are up to you. I love using bits of high-quality dark chocolate (or maca chocolate!) a little dried fruit and chopped raw nuts. 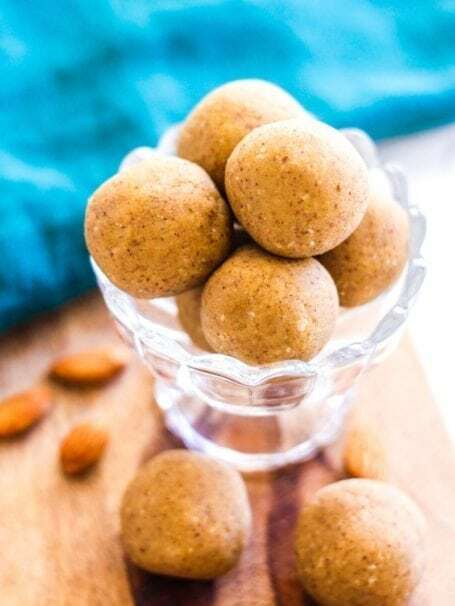 You’ll find heaps of my protein bites in my recipe search here. You might not think of chia seeds as super protein-packed, and you’re right – a 1 tbsp serving has 2g protein, but you get a whole lot more at the same time – healthy omega-3 fats, fibre, antioxidants and magnesium – just to name a few. 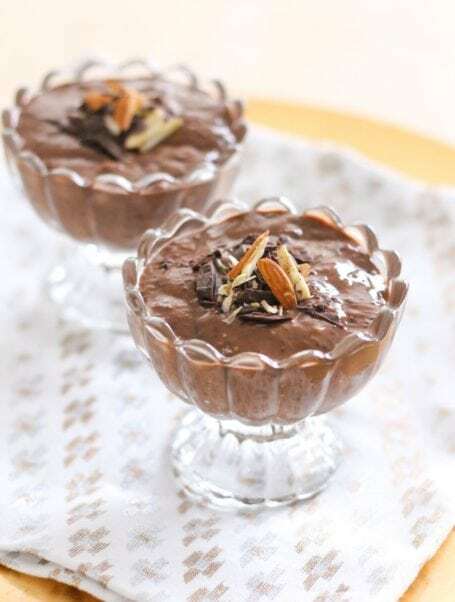 To further increase the protein content of chia pudding, I like to mix in a tablespoon or two of protein powder which also helps to add sweetness at the same time. There are many ready-to-buy options out there, but if you make them at home you’ll probably save money and you can control what goes into them. The following snacks are also high in protein, but because I choose to follow a mostly pescetarian and dairy-free diet, they’re not ones I eat much of. That’s just what works for me though, and what works for your unique needs could be totally different. 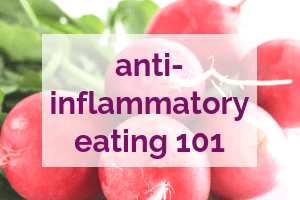 The common thread however, is that these foods are exactly that – real foods that haven’t undergone massive amounts of processing and refining. At the end of the day, no matter what sort of eating style you subscribe to, I think a focus on real, whole foods is what’s most important. Organic plain Greek yogurt – mix it with berries, cinnamon, vanilla and granola, or blend all these things up and pour it into popsicle molds. Alternatively for a savoury snack, blend it with fresh dill, lemon and garlic and turn it into a dip for fresh veggies. Organic plain cottage cheese – dress it up the same way you would yogurt, blend it into smoothies or eat it straight-up on its own. Jerky – Brands like Krave and Epic have a bunch of different options here if you eat beef, pork, bison, turkey and salmon. The ingredients are pretty clean from what I’ve seen so far, and I’m trying to find Epic’s salmon jerky here in Vancouver but haven’t had much luck yet. It anyone’s tried it, I’d love to hear what you thought! Alright, now it’s your turn! Tell me, what are some of your favourite high-protein snacks? What a great post. High protein snacks are my favorite way to keep that hanger away.